A bulging disc is not a cause for panic as they are fairly common in both younger and older people. A bugling or protruding disc is usually see at high rates on MRIs in patients that suffer with back pain and are also found in patients that are not suffering from back pain. Aging process and the degeneration process of the intervertebral disc are the most common reasons why a disc will bulge. A disc may also bugle in relation to a back injury and sometimes in regards to what kind of a lifestyle is led by the patient. Like we said before a bulging disc is not necessarily a sign that anything serious is wrong with your spine, so there is no reason to panic. When a bulging disc bulges enough to cause narrowing of the spinal canal it is considered to be a serious condition. If there are bone spurs present on the facet joints behind the bulging disc the combination of these spurs and the bulging of the disc may cause further narrowing of the spinal canal in that area. The care of a patient with a lumbar bulging disc is far from standardized. To a certain extend the treatment of a patients bulging disc should be more individualized. The bulging disc can cause leg pain (when affecting the sciatic nerve). This can often be referred as a herniated disc, ruptured disc, pinched nerve or a slipped disc. Treatment of a bulging disc will mainly be dependent on the length of time the patient has suffered with his or her symptoms and the severity of the related pain. Most treatments will start with six to twelve weeks of conservative treatment. If this conservative treatment for the bulging disc does not help to alleviate the pain from the affected area(s) and there are no signs of improvement then a surgical treatment is considered. If the patient is in experiencing consistent severe pain and having difficulty maintaining a reasonable level of functionality, surgery may also be recommended prior to the completion of the six weeks of conservation treatment. heal on their own without even the person afflicted knowing that there was anything wrong in the first place. There are no hard and fast guidelines for how long it will take and how to go about healing a bulging disc. The primary goals of conservative treatment for a bulging disc are to provide the patient relief of the pain and to allow them to return to a normal level of functionality. 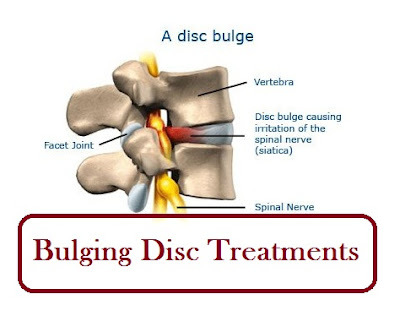 A wide variety of treatment options are available and here is a list of some of the most common bulging disc treatments. The amount of time invested in conservative treatment needs to be addressed on an individual patient basis. Some patients will not have as sever of debilitating pain or symptoms as other. In the patients that are still able to lead a productive lifestyle with only minor aches and pains a longer conservative treatment would most likely be advised. Back surgery for bulging disc treatment should be prolonged as long as possible. For some patients the pain and loss of productivity is just too much to handle and after conservative treatments are explored for a shorter duration and there are no changes in the patient's symptoms, surgery to decompress the affected nerve is often the next option as a bulging disc treatment. Patients that do not feel any recovery after six to twelve weeks of conservative care will often find themselves looking into the final bulging disc treatment option of surgery for their bulging disc. Any patient who has progressive neurological deficits, or develops the sudden onset of bowel or bladder dysfunction, should have an immediate surgical evaluation as these conditions may represent a surgical emergency. Fortunately, both of these conditions are very rare, and most surgery for a lumbar herniated disk is an elective procedure.